Many vegetable gardeners have not tried to plant potatoes and Master Gardeners are not exactly sure why. We can tell you that once you do, your home garden will never be without them again. • Buy certified “seed” potatoes from a nursery or feed store. Grocery store potatoes have been treated with a growth inhibitor to retard their sprouting in storage. • Choose a sunny location. Like their relatives – tomatoes and peppers, potatoes require full sun. • Good drainage is critical. Raised beds are highly recommended. You can always add water when they’re dry. It’s much more difficult to get excess water out of a waterlogged soil during periods of extended rain. • Cut the seed potatoes into pieces, each containing at least one eye (bud). You can cut them larger with several eyes per seed piece. • Lay the cut pieces on newspaper in the garage for 2-3 days to dry and callous before planting. Rototill the soil to 12 inches deep using a rear-tine tiller. Incorporate 4-5 inches of various types of organic matter, or buy a prepared garden blend and rototill it in. You want to prepare a planting bed with almost the consistency of potting soil. Potatoes can also be planted in very large containers. 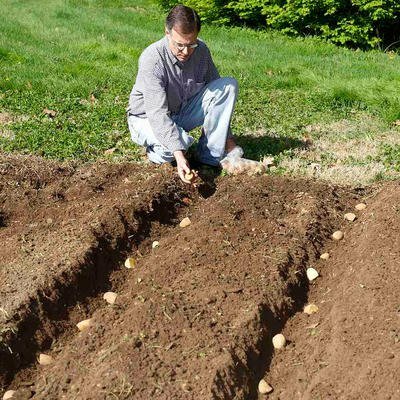 • Space your rows of potatoes 36 inches apart, with the plants 10 or 12 inches apart in the rows. • Pull 3 inches of soil up around their stems as the plants grow taller. • Texas A&M recommends side-banding a complete-and-balanced fertilizer down the rows when the plants are starting to grow and then repeating the application when they are 6-8 inches tall. New potatoes can be harvested when the plants are in full flower, but if you wait a couple of weeks until flowering has finished the potatoes will have grown to pretty much their full size. Try saving a few of your potatoes for use in your fall garden. Seed potatoes will be more difficult to find in early August when that planting time rolls around, and you can be your own source.